Are you thinking about what festival to attend this year or have you not even thought about it yet? Let us tell you some of your other options. Just as you know the golden ‘Glastonbury’ tickets are usually sold out well within the first hour and this seems to be a growing trend for festivals that have been long standing in the business and for most of the time we miss out and yet another year passes and we just watch it on TV dreaming about being there. Have you considered a festival outside the UK but not quite sure which one to check out? This is where we have the solution. How about a festival that is situated in the beautiful countryside of Switzerland, within easy reach of the Geneva airport. Heard of the ‘PALEO‘ festival? If you’re a solo traveler, have family or party with friends ‘PALEO’ offers the best atmosphere while also focusing on the environmental impact and smooth running of your day to day experience (from personal experience, it’s one of the cleanest and well run festivals we’ve ever attended). This year Paleo festival is celebrating its 40th year with over 230, 000+ attendees in 2014. It holds a reputation that is second to none, not forgetting the headlining acts that you all love, including musicians you may never have heard of but can add to your list of favourite new artists that you discovered there. There is loads more than just great music, including local & multicultural fresh food on a daily basis, also as you wander through the grounds you’ll see loads of visual delights, giving PALEO that magic touch that will be locked in your memory for many years. 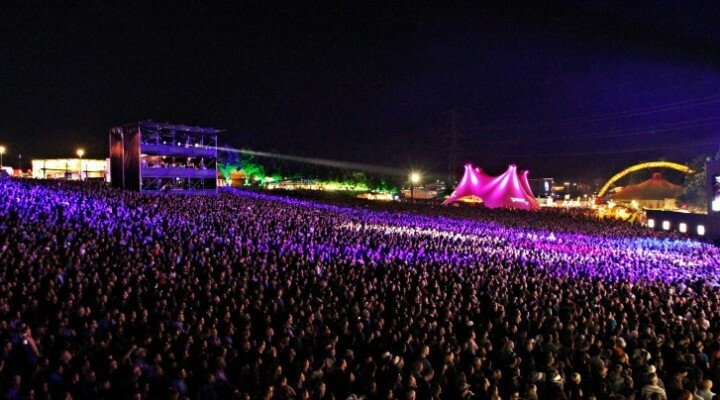 “Paléo Festival is today one of Europe’s most important musical events. Since its creation, the Festival has been growing in a regular and managed way, gaining steadily in professionalism during this period of development. Each year, more than 250 concerts and shows are on offer to the 230,000 members of the public who fill the Festival’s 84-hectare Asse site (car parks included), situated above the town of Nyon. To this day, near 6 million people have contributed to this unwavering popular success. For more than twelve years, the Festival has been sold out before it even started and enjoys an ever-growing reputation. In 2014, over 600 media professionals covered an edition that was noted for some unforgettable shows and a variety of architectural and artistic structures inviting dreamlike contemplation“. SOLD OUT :: But you have many other chances to get yours as described below. Ticketing for the 40th Festival was launched recently. Monday tickets had all found holders in only 20 minutes. In the space of 52 minutes, the whole 220,000 tickets were in the hands of festivalgoers. This success testifies the trust that the audience has for the Festival. A second chance for tickets starts with the “Ticket market” that will go live on Wednesday 6 May at midday on paleo.ch. All the artists of the 2015 edition will have the pleasure of producing themselves in front of a sell-out crowd from 20 July to 26 July. TAKE NOTE OF THESE DATES :: Here’s your extra chances to get tickets :: The Festival condemns the existence of black market sales and does everything to ensure fair access to tickets. The now traditional “ticket market” on paleo.ch, online from 6 May at midday, will allow people to buy and sell tickets at fair prices. This entry was posted in Festival reviews, Reviews and tagged PALEO, Paleo festival 2015, Robbie Williams, Sting, Switzerland. Bookmark the permalink.